It’s a well-known fact that when it comes to music, Santa Barbara’s cup is overflowing. In an attempt to introduce the public to these hometown musical gems, The Independent has joined forces with 1st Thursdays-a monthly downtown art extravaganza-to present S.B.-based musicians to the masses. And there’s no better place to start than with oso. We first became aware of oso here at The Indy after coming across their self-produced album. Made entirely of bees wax, the album cover, we soon learned, was an apt metaphor for the band’s outlook on music-making. “We are interested in making some covers with organic materials. There is a stripped down and textile feel of the wax, and it is very durable, very engaging,” said Phil Taylor, oso’s singer and guitarist, who could just as easily be talking about the group’s sound. oso strives to combine the interests of each band member to create a solid, original sonic whole. Avid violinist Nick Coventry (also vocals) delivers a gypsy sound, and as a student of electronic music composition, Tim Beutler (drums, vocals, computers) carries the beats. Andrew Fedders (bass, vocals) takes the band’s eccentricities a step further, interpreting his interest in the flight and dietary patterns of wounded hawks musically. Trust us, it’s way cooler than it sounds. The members of oso write their own music and swear by the fact that all the lyrics exist in their heads, not on a pad of paper. As a result, they’re never quite sure how a show is going to go, just that it will most certainly rock. At times they play stripped-down acoustic sets. Other times they improvise right on the spot, trying to pass into the rawness of the moment with the crowd. Their sound can be compared to technical-folk, math-rock, and world music. But the boys prefer their own lingo, referring to their sound as “technical autism folk, a mix of digital sounds, like a wind storm blowing a diagnosis of ADD with a wave of modern classical,” explained Taylor. Speaking of ADD, it is Taylor’s enthusiasm that has people wondering, “What is he on?” But he swears the group’s a “fitness rock ‘n’ roll band” that just happens to be highly caffeinated before each show. And their happy-go-lucky attitude carries over into the band’s future outlook, as well. Although they say they are not interested in signing with any major labels, they are interested in having smaller, independent representation. oso’s next big gig takes place Thursday, May 3 at Borders Books on State Street. They’ll be playing to the 1st Thursday crowd, a setup the guys seem to be pretty comfortable with. “At times we feel like outsiders in some ways, and when we have people recognize what we are doing and have a positive connection with them, it is a fun and exciting thing,” said Taylor. “I have no idea what to expect. The least expectations make better shows.” And though Taylor’s expectations may be modest, judging from oso’s sound and style, yours should be high. 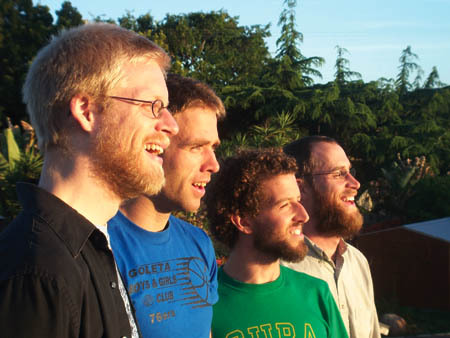 Oso plays Thursday night, May 3 at Borders, 900 State St., in conjunction with 1st Thursday. For more info on oso, visit myspace.com/thebandoso or oso-music.com. For 1st Thursday details, visit santabarbaradowntown.com/go.asp.